Which Promotional Charging Cable Should I Buy? There are dozens of factors to making a decision in buying a promotional charging cable. We've surveyed our customers and staff and come up with the most important considerations in buying a promotional charging cable to give to clients. 4 charging tips, including the newer USB Type-C adaptor, that can be used with multiple devices. Another factor to consider when looking for an Apple-compatible promotional charging cable is whether the product is MFi certified. MFi certified cables, although they are at a slightly higher price point, ensure safety and compatibility with Apple® devices and has been approved for both charging and data transfer. Which connector type should I choose? With so many varieties of cables on the market, how do you decide which type of charging cable will meet the needs of your clients? Do the majority of your clients use iPhones, iPads, Android® phones, other tablets, laptop PCs? How would you even know? The two most popular models of cables on the market today are the lightning cable and the USB-C cable. The easiest way to cover all of your bases is to offer a charger with multiple tips. Crestline offers charging cables with two, three, four, or more connectors, making them useful for the widest possible range of recipients. Finally, consider offering a tech kit with more than one connector type. As useful as charging cables are, they're even better with the right accessories. Treat recipients with charging kits, like the Large Stretchy Charging Set, that include wall or car adapters, power banks, travel cases and more. As a rule of thumb, shorter charging cables and thicker charging cables will charge devices faster. Charging speed depends on the number of watts that can be carried through the cable. To date, there have been four USB charging cable standards with respect to speed. USB 2.0 is the most commonly used standard today. USB 1.1 or "Full Speed" USB: USB 1.1 devices can reach a maximum transmission rate of 12 Megabytes per second (Mbps). USB 2.0 or "High-Speed" USB: USB 2.0 compliant devices can reach a maximum transmission rate of 480 Mbps. USB 3.0 or "SuperSpeed" USB: USB 3.0 compliant devices can reach a maximum transmission rate of 5 Gigabytes per second (Gbps), or 5,120 Mbps. USB 3.1 or "Superspeed+" USB: USB 3.1 compliant devices can transfer data at 10 Gbps, or 10,240 Mbps. The high-speed Android® W/ Mfi Adaptor, in addition to offering an attention getting all-over imprint, offers a fast transmission rate. The popular multi-tipped Octopus charger is also in the USB 2 high-speed category. Just one caveat, the charger and device used with the Type-C charging cable must also support that speed for maximum speed, so your mileage may vary. What is the ideal cable length? The answer to that varies depending on the intended use. There's no one-size-fits-all, and consumers should consider where they'll be charging their devices most of the time to find the right cord length. In general, though, it's best to err on the side of shorter. Less length means faster charge times and less area for potential failure, and also has the benefit of making it more difficult to use a device while it's plugged in (a big no-no, for reasons detailed later). Cords come in a range of lengths, from one foot to more than 10 feet. Three feet is the most common standard length. For charging from a USB port on a desktop computer, one foot of or less of cable should be sufficient. For the hotel rooms and planes that frequent travelers find themselves in, short is best. Hotel night stands have outlets and charging ports built into them or on the wall right next to them. Airline seats have outlets built right in as well. Long cables are just an annoyance that gets in the way in that setting. In a car, three feet is a good length. This is long enough to allow a driver to place the phone in a stable resting place, but not so long that the cord is likely to become tangled or get in the way of safe driving. When leaving a device on a nightstand or counter, up to six feet of cord might be warranted, depending on the distance of the surface from the nearest outlet. Many people also have a designated couch charger for the living room. To charge a phone while using it from any seat of a couch, you need a pretty long cable. Longer cords of nine feet or more can come in handy in public locales such as the library, a coffee shop, or another area where it might be difficult to find a spot right next to an outlet. It might seem like a personal choice, but the thickness of a power cable can make a difference in a charger's efficiency and speed. A thicker cable will charge better than a thinner one, especially when the cable is longer than six feet. The white and green wires are for data. Their capacity determines data transfer speed. The red and black wires carry the power for charging. Their capacity determines charging speed. The amount of power a cable can carry at once is determined by the size of the 5-volt charging wires inside. A standard wire is 28 gauge and is capable of carrying about .5 amps, for a standard charge rate of about 2.5 watts (watts equal amps times volts). If that all sounds Greek to you, think about it like a water hose, with volts representing the water pressure in the hose, amps representing the rate of flow, and watts representing the volume of that water. A garden hose is capable of putting out a lot of water fairly quickly, but if you connected a fire hose to the same water source, the volume of water output would be much higher due to the larger capacity of the hose. A great hands-free option for tradeshows, conferences, and other events, your logo will get maximum exposure on this useful gadget. Your logo will travel far on a keychain that also doubles as a charging cable. 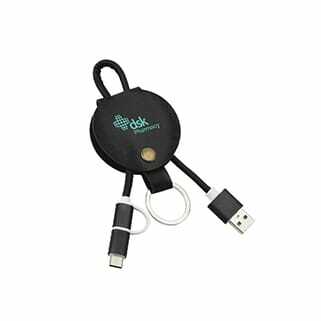 A charging cable with a carabiner attachment allow users to attach the charger to keyrings, bags and lanyards, which offer additional branding opportunities. Retractable charging cables are great for travel, as they won't get tangled in your luggage. They are also the perfect size to transport between home and the office. Kits that include charging cables, power banks, and other tech accessories are great options for those who are on the go or travel for business, as they are highly portable and keep everything neatly together. As people tend to keep promotional items that they can use, custom imprinted charging kits are likely to be spotted at the airport, at conferences, and on college campuses. People choose promotional products because of the option to display a custom logo on the items. While consumers will remember the gifting company regardless of the size or placement of the logo, it's important to consider the logo size and placement in all promotional buying decisions. How big will my imprint be? Perhaps you're wondering how much of an impact your branding message will have on recipients when presented on such a small product. Custom charging cables have a variety of imprint areas, ranging in size from a little as 3/10 of an inch high for an imprint on the cable itself to 4 inches or more for an imprint on a carrying bag. While charging cords tend to have a smaller imprint area, there are several added features which can bring extra attention to your name and logo. Chargers with light-up logos, chargers with full color logos, chargers with cases, and charging kits are all examples of ways you can maximize your logo imprint area, and because they are fun and useful, they are likely to be held on to by their recipients. For best results in ensuring your logo or message will look clear and attractive on a charging cable or carrying case, send either a vector file (PDF, EPS, AI, SVG, or INDD) or a high resolution (at least 300dpi) image file (JPG, BMP, TIF, PNG, GIF, or PSD). Be sure that your image has crisp, clean lines and is not pixelated or muddy. If you're not sure your art meets those guidelines, Crestline's graphics team is here to assist you at no additional charge. Just let your sales representative know you'd like help with your art. A 3' charging cable with an illuminated logo area compatible with Micro USB, Apple® 8-pin, and Type-C USB devices. A multi-use charging cable with a micro USB, Type-C and a 2-in-1 dual-compatible tips for both Apple® and Android® devices. The cable stores neatly inside the included plastic case. A genuine leather cord holder with elegant accent stitching. The leather pocket neatly stores a 2-in-1 Android® and iOS charger tangle free. A flat charging cable in an extra-long size, made from cotton canvas. Comes with a USB Type-C adapter, a 2-in-1 dual adapter for iOS and Android® devices, and a PU wrap strap to keep cord neat and tangle-free. This handy kit includes a power bank, USB wall charger, USB car charger, and 3-in-1 charging cable with USB adapter, inside a polyester pouch. 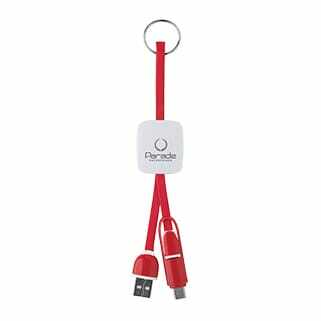 A charging cable that easily wraps around itself and stores as a compact plastic square, compatible with micro USB devices and Apple® devices (MFi Certified). This premium set has a low minimum and includes a roomy vinyl backpack, an 8000 mAh power bank, and a 2-in-1 charging cable. This bundle would make an excellent corporate gift or a golf tournament prize. Impress your business partners and clients with a deluxe kit that includes a power bank, Bluetooth® speaker, and charging cable in a black gift box with four full color imprint areas for your logo. The charging cable has a USB to micro USB or Apple® certified MFI lightning tip. When one needs to charge up more than one device at a time, a multi-function charging option can save time and keep everything up and running. As stated earlier, universal charging options are in high demand, as they work for everyone. Additional choices include: the Leather Look 3-in-1 Charging Cable Key Ring and the 3 Way Retractable MFi Noodle Cable. There are several types of universal charging cables available with differing ways to access the attachments. There are chargers with built-in attachments, allowing convenient access to each charging tip, but these tend to be bulkier in size. Others have interchangeable tips, which are more compact, but require a quick flip to switch from one to the other and cannot charge more than one type of device at a time. What Kind of Special Features and Accessories are Available for Charging Cables? The 3 ft Metallic Multi-Charging Cable with Type-C and the USB Extension Cable feature a trendy, braided look. Braided cords were initially created to prevent "turtlenecking" common to Apple® lightning cords. Turtlenecking is a term that describes a charging cord that becomes crimped and frayed at the ends, shortening its lifespan. Fabric cord chargers prevent this from happening. The LitUp™ Charging Cable, in addition to looking futuristic and cool, features a flowing current of light while charging and then shuts off the light to let you know that your device is fully charged. It charges both Apple® and Android® phones. As technology speeds ahead at a rapid pace, more device manufacturers are cutting the cord on power cables altogether, opting instead for wireless charging stations. Using "Qi" wireless technology, these handy inventions allow users to charge up their devices by simply laying them on top of the compact charging surface. We love this cable for its length (3 feet) and the light-up feature for visual interest. A great value with a multi-tip that can support any phone type. This one is small enough to fit into a purse, accessory bag, or pocket, and can extend to different lengths, depending on its intended use. 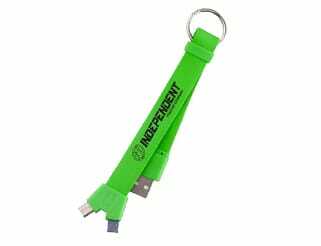 A great portable option that fits on a keychain, making it easy to bring with you anywhere! We love the convenience of this six-foot charging cable. Use it at home, at the office, or bring it with you when traveling for times when there isn't a power outlet close by. We chose this charger for its light-up logo and indicator feature. It is easy to pack for travel and comes with four different connectors: a USB, Micro USB, Type-C and 5 pin/micro USB adapter. Who Uses Promotional Charging Cables? Business travelers, who are continually on the go, need to keep their devices charged up wherever they are. 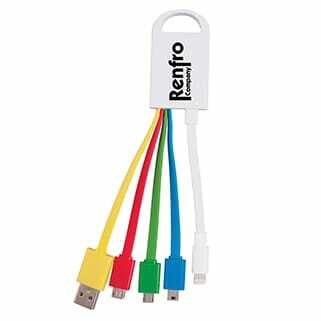 Branded charging cables are memorable personalized giveaways for trade shows, conferences, or other business events. College students treat their devices as an extension of themselves, staying plugged in for education, recreation, and more. Chargers featuring a school logo or mascot make exceptional recruiting gifts or a popular merchandise choice to stock in campus bookstores. Healthcare professionals need to be reachable at all times. Their ability to keep their devices charged can literally be a matter of life and death. 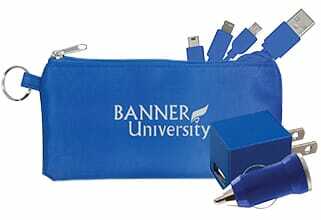 That makes custom charging cables a natural promotional marketing piece for drug or medical equipment companies. Everyone, regardless of lifestyle or profession, can benefit from useful tech accessories. Your clients don't have to be jet-setters to appreciate the quality and convenience of a custom printed charging cable. Worldwide, approximately 5 billion people—67% of the planet's population—own a mobile phone. In the United States, that percentage is closer to 95% or more than 300 million people. On top of that, more than half of Americans own tablet computers. That's a lot of devices! According to a study by the Advertising Specialty Institute (ASI), 87% of consumers say they would keep a promotional power bank because it is useful. Furthermore, tech products are a great way to make inroads with younger consumers. A 2016 ASI study showed that 60% of young people, ages 18 to 24, owned and used promotional USB drives, as did 51% of those ages 25 to 34 and 48% of those ages 35 to 44. Charging cables are an item that absolutely everyone needs, and the more of them you have, the better. The cables that come with phones don't typically last the life of the device, so replacements are a must-have. On top of that, no one wants to get stuck without one, so the smart move is to leave one everywhere you'll use it: in a purse or backpack, in the car, on your desk, on your bedside table and on the kitchen counter. Crestline's Director of Vendor Relations puts it best, "Have you ever seen anyone ever turn a free one down unless it's the wrong type of cable for their phone? Most of them now are multi-tipped. So, it's probably one of the best giveaways right now because no one's going to throw it away. It's the ultimate giveaway." In addition to custom imprinted charging cables, you may also want to consider adding best-selling PopSockets®, Silicone Tech Pockets, or a Tuscany Phone Pocket with Ring to your next promotion, giveaway, or event. Browse our selection of tablet and phone stands and visit our buyer's guide to learn more about promotional tech accessories. Promotional power banks are another useful item that eliminate the need to plug in your charging cable into a power source, and can be used in conjunction with custom imprinted chargers and charging cables. USB flash drives and USB hubs are some of the most popular promotional items out there with consumers keeping these tiny essentials for a year or longer, on average. Two of our best-sellers are the Fold-a-Flash USB Drive and the Quartet USB Hub. Another tech accessory that can enhance a user's experience with their mobile device is a stylus. Pens with stylus tips allow for more precision when using touch screen devices and are an affordable giveaway item for just about any type of business or organization. The Easy Writer Stylus Pen is a customer favorite! Can charging cables be recycled? Yes! To minimize the amount of waste in landfills and prevent the leaching of hazardous chemicals into our soil and drinking water, it is important that all electronic waste—or e-waste for short—be properly recycled. In fact, many local and state governments have mandated e-waste recycling laws. Some municipalities will accept these items for recycling at the community dump or transfer station, either as a service to residents or for a small fee. In other areas, you may need to find a dedicated e-waste recycling facility. Can you bring charging cables on a plane? Yes. Charging cables are allowed in both checked and carry-on luggage. Most portable charging stations are also allowed. The only restriction on charging devices is on portable chargers or power banks that contain a lithium-ion battery. Lithium-ion batteries and chargers carry a risk of short-circuiting and, if left unattended, could cause an explosion or fire. Passengers must pack these devices—up to two per person—in their carry-on bags. Why do charging cables stop working, and how can you prevent them from breaking? Charging cables are made up of a bundle of tiny delicate wires covered in a protective outer layer, usually made from plastic or metal. These small wires are very fragile and can break easily if subjected to bending or pulling. The most common reason charging cables break is due to misuse. To prevent cables from failing, never unplug them by tugging on the cord; always grasp the cord by the end, near the connector. Additionally, devices should not be used while charging. Not only does this compromise battery life, but it also puts extra strain on the cord, which can get jostled and bent at sharp angles. Finally, protect cords while traveling. Leaving them loose in a bag or tightly winding or knotting them will shorten their life. What is the best way to pack charging cables? To prevent cables from becoming tangled or damaged, it's best to coil them loosely in a protective case when traveling. There are plenty of do-it-yourself cord storage solutions for budget conscious travelers—a binder clip or eyeglasses case works great in a pinch—but there are also a number of inexpensive, easy-to-use purpose-made options for stowing cords. Tech tacos—so named for their folded over semi-circular shape—are one popular and cost-effective choice. Some cables, like the Charging Cord with Taco Organizer even come with their own built-in organizer or an added storage case. What Are Charging Cable Certifications? CE: This certification mark indicates that a product conforms with the health, safety, and environmental protection standards for products sold within the European Union. Products can be self-certified by manufacturers. FCC: This mark certifies that the electromagnetic interference from a device is under the limits approved by the FCC. UL: Products with this seal have been tested by Underwriters Laboratories, another National Recognized Testing Laboratory (NRTL), and has been certified to meet the minimum requirements of widely accepted safety standards.